rockn wrote: The wooden roof is made with a Draft Path Array along a Spline. Also the woods are not properly modelled, just placed one inside another. which is always result in errors and gaps here and there. On the other hand you even placed the bolts and nuts in the wood columns. So attention on details on one hand, and overlook on another part of the model. Just wondering, if the wood in the pergola should not be vertical. In your model it follows the curve. Maybe your approach is better (more light can pass through the roof). Ah this roof ! No I have same problem than you when I want to cut the wall directly with it. Look inside Wall object, I model a solid to cut the wall. arcol wrote: Also the woods are not properly modelled, just placed one inside another. Yes of course, it's the next step. The model was made in only few hours. There is some work to do on the big arches, they have to be sectioned at least in two parts and connected with metal connector. Also the beam have to be cut a intersection, I think I will make this by cutting the original beam, same for modelling the drilling hole at each intersection. There is also also two beams that need to be longer to be connected on the building wall. And as I have no control inside a Draft Path Array to exclude some part of the array, I think I have to downgrade the Array once the beam are well modeling and add the longer beam. Or I can hide the unwanted beam by making a boolean cut with a bigger Box. About vertical or inclined, it's an aesthetic choice. But inclined is more easy to machining : no need to machining the big arches and it's the same cutting for each beam. Great work. Always nice to see architecture work can cope with mechanical engineering part in FreeCAD. And that it is is not only up to the tool (software used) to push the boundary there is still human factor involved. Some time ago I participated to a contest with some simple designs, for which I used FreeCAD. This is a Rocket engine I was working on for Drag Racing. mickleclarck wrote: All of doing great job. I just like your creativity. I want to share my creation. But I don't know how. Any suggestion please? When writing a post look just below the text input box...Attachments...click on it and then "add file". If your FreeCAD file is too large then you have to either make it smaller or host it somewhere else and just add a link to it. Create a screen shot and add it to your post. If your design is complex, sometimes you can create a Part WB simple copy...then delete the creation history to make the file small enough to add here. 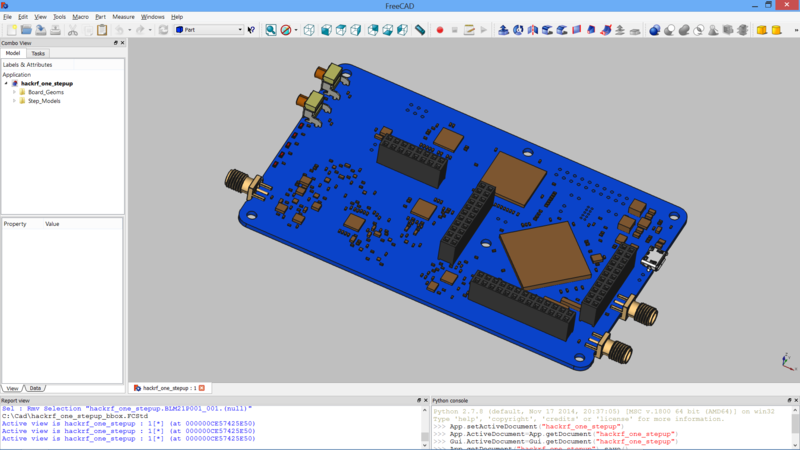 starting from IDF Mod importer and FreeCADPCB Mod, I developed a script to export kicad board and modules in STEP AP214 (with colors). 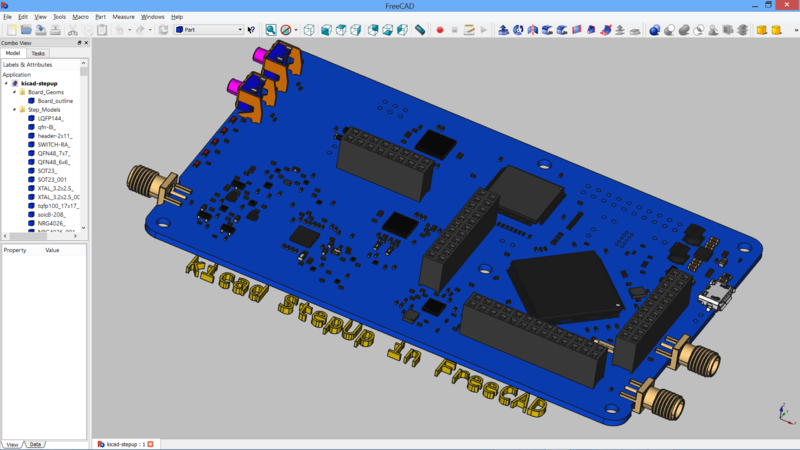 Kicad StepUp allows the user to modeling the 3D modules starting from FreeCAD (instead of using Wings3D), creating models in STEP AP214 and rendering the pcb board and components in native STEP AP214. Designing in kicad native 3d-viewer will produce a fully aligned STEP version with the same view/dimensions of kicad 3d render. Now you will have the two words with the same appearance; one can design in kicad EDA and transfer the artwork to MCAD (FreeCAD) smoothly. The idea under the script is to have a VRML library in kicad aligned to the STEP lib, and just designing in kicad as usual. I do not know if it's late, but I leave this picture to have a piece of furniture. It's never too late I like the exploded view!